Include communities in the decisions affecting them! What residents are saying about the LNG project in Colón, Panama. On a recent visit to the United States, the President of Panama, Juan Carlos Varela, spoke at length about his plans for the city of Colón, home to the largest free-trade zone in the Americas. In addition to planned investments totaling 1.2 billion USD, President Varela is championing the expansion of the duty-free zone to eventually cover the entire city. It is unclear whose interests will be served by such projects and whether the people of Colón have had the opportunity to say anything about the creation of such plans. 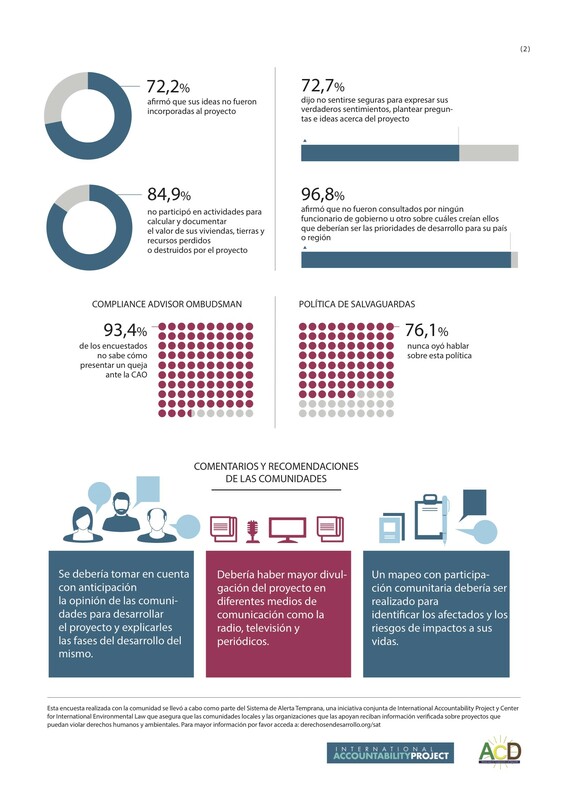 A recent community-led research project conducted with the assistance of International Accountability Project (IAP) and the Alianza para la Conservación y el Desarrollo (ACD) leads me to believe that the priorities and opinions of the people living in Colón have not been considered in the development of President Varela’s plans. More than 95% of respondents said they have not been consulted about the project. 82% said they did not have enough information to express an opinion about the project. But even if they did, more than 72% said they did not feel safe to express their opinions about project plans. Because this is a project financed by the International Finance Corporation, those affected negatively could submit a complaint to the independent accountability mechanism, the Office of the Compliance Advisor/Ombudsman, but unfortunately more than 93% have never heard about the mechanism and 76% have never heard about the bank’s policies to account for social and environmental risks. These numbers indicate that community engagement is not a high priority within the ‘development’ agenda of the Panamanian government. 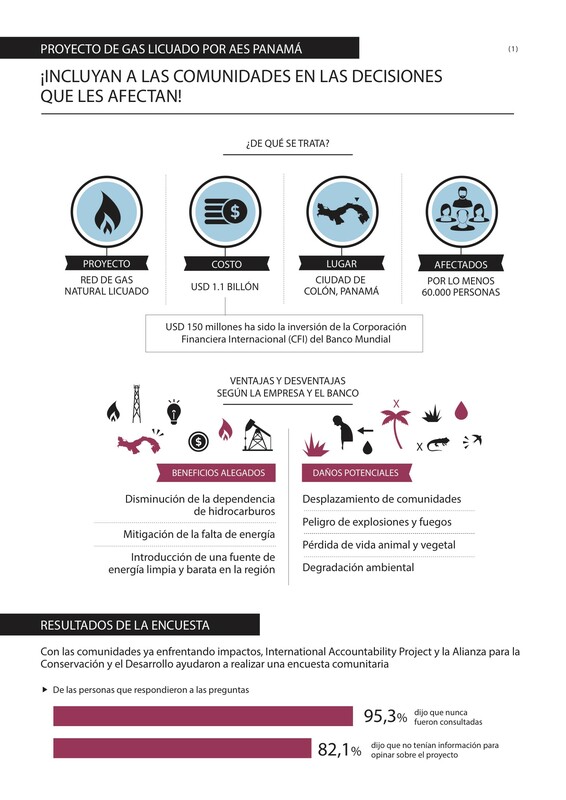 How can a government pursue the design of a project that risks, among other things, displacement, explosions and environmental degradation without the full participation of those impacted? Neglecting the priorities and well-being of local communities is not new in Colón. Massive amounts of investment have historically been directed at city and yet, this has not translated into benefits for the local population. A majority of residents live in unsafe environments, as infrastructure continues to crumble after decades of neglect. The exception is, of course, the Free Trade Zone which is in much better shape than the rest of the city. In this context, President Varela’s plans to expand the Free Trade Zone could, at first glance, seem like a good idea. However, it should not be forgotten that residents of Colón are considered outsiders in the Free Trade Zone — they need to secure special permission to shop there. Residents are mainly utilized as a source of cheap labor. Goods are produced for the export markets and the profits only benefit businesses and investors, not local residents. While Varela affirmed that US$ 1.2 billion would be invested in Colón, the LNG project alone will cost US$ 1.1 billion. A vast majority of the money directed to Colón will be used for an activity that aims to produce gas that will be sent directly to Asia, calling into question the benefits, if any, for those actually living in Colón. One has to wonder: has anyone really asked residents what their development priorities are or what their plans are for their families and city? Would they have prioritized an LNG plant and export center? To quote from a few respondents of the survey, the answer may be a lot more complicated than what the government claims: “No to the construction of gas plants!”; “Cancel the AES project and reforest the affected area”; “Impart information through the media and include the communities”; “Invest in wind power, which is more ecological and doesn’t cause harmful impacts”. Any project, to be successful and merit the use of the word development, must prioritize the inclusion of impacted communities. While local and national priorities may diverge, a good faith dialogue the includes affected communities could bridge the divide. As one resident puts it, “in order to develop the project, the opinion of communities should be heard (…)”. Government and investors should be asking themselves if the residents of Colón would really benefit from an expanded Free Trade Zone or investments in extractive industries. The findings from the community-led research project will be presented in a forthcoming report by IAP and ACD. We hope the report will be considered seriously by those planning to invest in Colón so they may listen to communities and prioritize real development in the region.